Recently I’ve seen some heraldic proposals best dismissed as excrementitious, so I was delighted to learn of one coat of arms that seemed truly worthy of the term. In promoting an upcoming travel programme filmed in the village of Pozoblanco (which translates to ‘White Well’), Andalusian Public Television mentions local lore stating that the town’s name derives from a well which in time was covered with so much chicken, er, faeces that the stones appeared to be white, and that said well was depicted on the town coat of arms. A quick Google reveals that in other versions of the town’s history not only chickens are held responsible, but other animals as well! 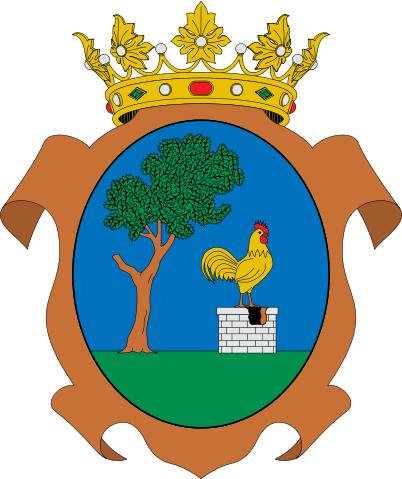 By now I was quite curious as to what the coat of arms actually looks like; I found the official blazon signed by the mayor, which mentions the chicken and the well, but contains no scatological references. And Wikimedia hosts an image of the arms, as seen here, but this too seems to have been sanitised.